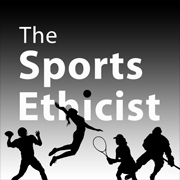 The Sports Ethicist Show airs tonight at 6 pm (Central) on Rockford College Radio. A podcast of the show will be available after the show airs. Post-concussion syndrome is what you were looking for with injuries. Good discussion. I am a Blackhawks fan and enjoy the occasional body check. No serious injuries or brawls are needed for my enjoyment of the sport. I am a Blackhawks fan and know physical contact is part of the sport. I do not think it is unreasonable to follow the rules that other sports follow as far as violence. It all comes down to self-control and ability to work as a team.